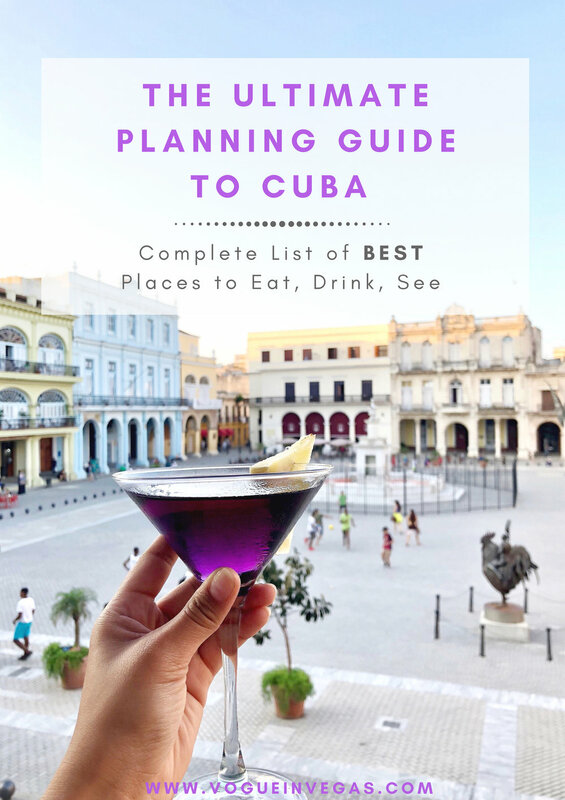 Note: This is a continuation (Part II) of my Ultimate Planning Guide to Cuba. If you have yet to read it, you can find it here. If you just want my list of recommendations, then you have come to the right spot! I have divided my list by city and by what type of activity (where to visit, where to eat/drink and sometimes the best photo spots). This is the National Capital building and one of my favorite photo spots in Havana. Right in front of it is one of the most popular photo spots in all of Havana--the colorful buildings. I called it "The Painted Ladies". This is one of the largest cemeteries in the world and a national monument built by Galician architect Calixto Areliano de Lorira y Cordoso. Many of the tombs are artistic masterpieces themselves. so it is definitely a sight to see! This is one of the most classic spots and go to hotels as it lies in the heart of Old Havana. It is also where all the classic cars are parked and one of the easiest places to find a classic car to start your Classic Car Tour of Havana. This is a popular paladar and is a Bar de Tapas style restaurant located in Plaza Vieja. It is located on the 2nd floor overlooking Plaza Vieja and was one of my favorite places! They have an amazing ropa vieja here and was the perfect way to end my trip to Cuba. Located in Habana Centro, this is one of the most popular paladares in Havana thanks to its appearance in Strawberry and Chocolate and it being Beyonce's favorite restaurant. It even has a fancy staircase and a nice rooftop from where you can take pics at! YOU MUST GO HERE! This was the first place I ate at when I arrived in Havana and it was the best intro to Cuba. 2 CUC Mojitos, not a single dish over 6 CUC. Do I even need to give you more reasons to want to go here? Note: If the staff offer you a chance to wait for a table up on the terrace I would take it. The staff here has it together and will not forget about you. Order one of their amazing daiquiris and relax and enjoy the warm Havana night! I came here for lunch on my second day in Havana and it was great! Best part? Live Music plays while you eat! Reasons to go to this place: It has a terrace, live music and REALLY good food. Note it is a little on the pricier side in comparison to most restaurants in Cuba--still cheap compared to America! Fancy food and a beautiful rooftop! Need I say more? 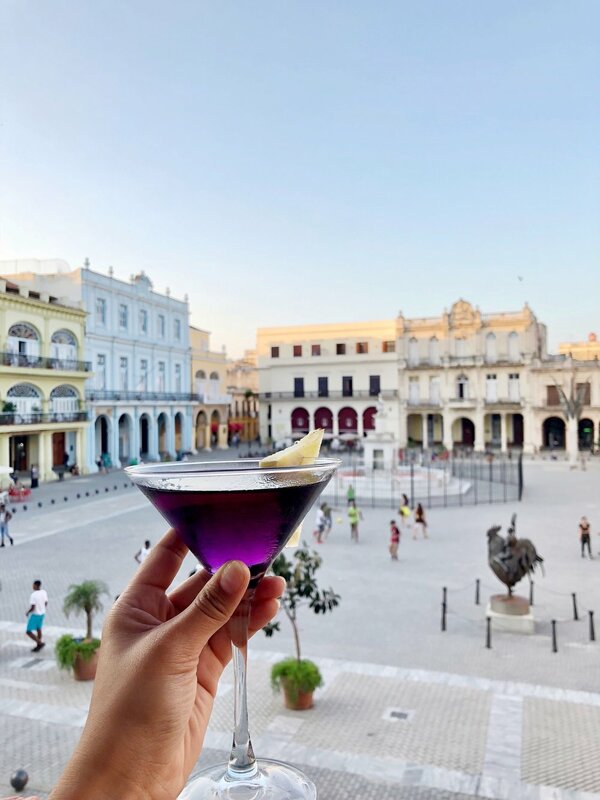 This is probably one of the most iconic locations and a major tourist hot spot as it is famous for being "la cuna de daiquiris" meaning the birthplace of daiquiris. It is also known to be Ernest Hemingway’s favorite hangout! One of the infamous daiquiris! A popular tourist spot because it is the Birthplace of the Mojito! I will say though that it is quite pricey at 5-6 CUC per mojito compared to the 2 CUC mojitos you can get at most other places. Almost as good as the ones you find in Spain! The churros here are relleno meaning filled--I got the strawberry filled one. Most of Havana is already really photogenic--from its colorful houses to its colorful cars and picturesque streets. These are just additional spots that I went to. Get there early in the morning to avoid the crowds or get there on a Sunday as most places will not open until 9 am meaning most tourists won't be out and getting a photo without tourists is easy! Legend has it that if you touch the El Caballero de Paris statue beard, finger and foot all at the same time, it will bring you one year of good luck. Did you even go to Cuba if you don't have a photo in front of these houses? Head there first thing in the morning for prime photos with no people! Premier Nightclub in an Art Gallery in an oil factory...LOL WHAT?! Yeah I said the same thing! This is a must visit. Peso food central! You know where to go if you're really broke and trying to stretch your money. Just off Plaza de Armas on Calle Brasil, you can find more budget food in Havana – here, there’s a small shop that sells decent peso food. Bar located at the entrance of a mountain where African slaves made a tunnel through to hide from the Spaniards. It leads to a restaurant that is divided in areas according to Saints. People sit in the area of the Saint they are considered to be a son or daughter of. Vinales is sprawling with many cheap places to drink at. My only TIP is to ask for a Coco Loco while in Vinales. What is a Coco Loco? Essentially it is spiked coconut water. They add rum and honey typically. They have dining options in here too! Apart from Havana, Trinidad has to be the most historic city in Cuba. Old Town is only accessible on foot or horseback (or carts)--this is important to know for when your taxi colectivo is dropping you. Also, Trinidad is quite hilly so it might be a bit of a struggle to get up those cobblestone streets with luggage. *There are many stands nearby selling mojitos for 1 CUC! A nightclub in a cave. NEED I SAY MORE? This place is amazing and a must visit during your time in Trinidad. This is one of the nicest beaches to watch the sunset from in Cuba especially in the Sancti Spiritus region. There is also a small beach front restaurant here that serves food and is actually not too expensive! Well there you have it! This is literally all my recommendations for Cuba based on my research/places I went to.